By the time she was a teen, Anna Gare could magic up a meal with a few ingredients and the most basic of equipment. And as a TV host, kitchenware designer, caterer and mother, Anna is now cooking meals that satisfy festival crowds, big families ... even royalty. For her, food is here to put smiles on faces and help us celebrate life - if it happens to be healthy, even better! Delicious Every Day is a collection of Anna's most relied-upon recipes, collected over decades. Most recipes are gluten-free, because that's the way Anna eats at home. There are drama-free midweek meals to satisfy fussy eaters and show-stopping salads to share. The chapter of one-pot wonders is tailor-made for nights you just can't face a sink full of dishes. There are even TWO dessert chapters: one heavenly and virtuous; the other unapologetically sinful. The one thing these dishes have in common is that they've been cooked again and again because they deliver on taste, flavour and - in most cases - health. Bring some drama-free deliciousness to your everyday. 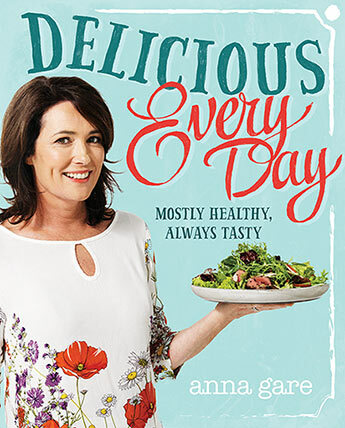 Anna Gare has graced our screens for several top-rating cooking shows, most notably hosting Channel Ten's hugely popular Junior Masterchef and co-hosting the first series of Channel Nine's Great Australian Bake Off. She has a bestselling kitchenware range that sells in outlets all round the country. For 16 years she ran one of West Australia's most successful catering companies, Deluxe Catering. Prior to that she was a member of a successful touring all-girl band presciently named The Jam Tarts.